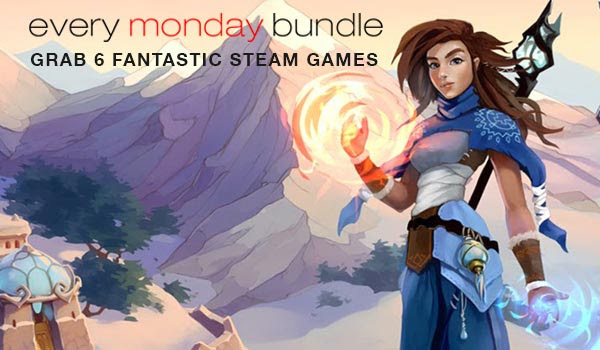 IndieGala Every Monday Bundle: Sentimental, Strategic, Puzzling, Violent | "DESTROY ALL FANBOYS!" Six indie games for $1.89 and this time all of them look worth diving into. No backlog hoarding in this week’s set thanks to the brevity of the paradoxically languidly paced Home is Where One Starts clocking in at under an hour. It’s a sweetly sentimental short game about making memories, something some see as just posting pictures of food, babies and whatever animal of the day video hits their inbox. This short interactive tale might make a few of those folks dwell longer in their own memory well if they give it a go. The other interesting game here on a more cerebral level would be The Logomancer, a game made in RPG Maker with a “combat” system that’s a lot more interesting than your garden variety JRPG-inspired (yet completely original) indie. Conflict negotiation and talking one’s way out of trouble is the order of the day for your party members, and those stylized visuals only add to the game’s uniqueness. A nicely done original soundtrack rounds out the fun here. The other games are a formerly mobile gone PC puzzle game called One More Line, the two Braveland turn-based strategy RPGs, and finally, the hyper-violent but ridiculously funny Mayhem Triple (which may have you seeing angry alien cartoon rabbits falling from the sky when you’re in dreamland later tonight). Ah, variety… I guess. Anyway, under two bucks gets you some cool indies you’ll enjoy. All you need after that is time to play them. This entry was posted in 2015, Commentary, DAF, Humor, Updates and tagged Bundles, Buy These Games!, DEALS, Digital Games, Downloads, Every Monday Bundle, Indie Games, IndieGala, Monday!, PC, PC Games, Sales!, STEAM, The Backlog!, Valve, VGA 101, Videogame Appreciation 101, Videogame Trailers, YouTube by geelw. Bookmark the permalink.